Survey is a comprehensive study to a particular object that aims to obtain the expected data. Survey is one of the best and most widely used by founders of social media, which aims to evaluate the things they has made so far and to improve the system and to transform the system into a better direction and more importantly also to gain new information, interesting and fun. As well as to share ideas that we have. 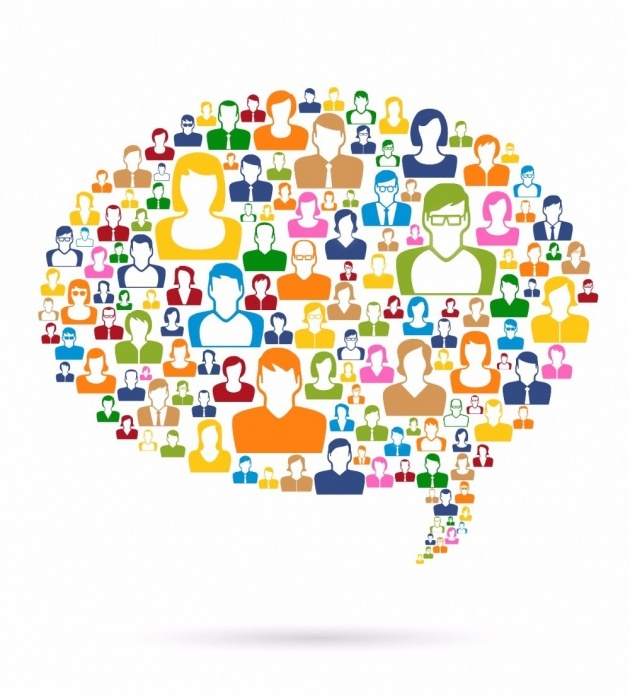 Now Bitlanders also is conducting a survey on Global Chat. Survey is slightly different from the survey in general are just asking questions, but this survey could give 30 bitMiles Loyalty Points of every answer we give. 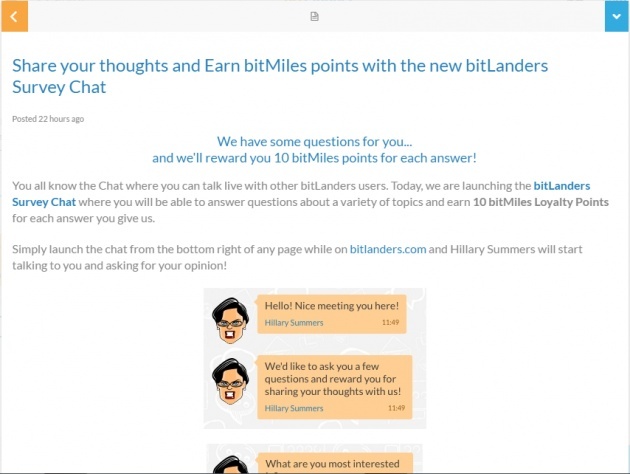 Besides can share interesting ideas we can also get bitMiles Loyalty Points simply by opening the Global Chat and answered every question either of Hillary Summers, Micky-the-slanted-salerno, and Bitlanders. Bitlanders is social media is the most interesting and the most convenient for me to earn money online and challenge because in this site we are encouraged to create original content in order to get maximum results. At first I do not like to write a blog but when they entered the site Bitlanders, I feel blogging is a basic requirement that I have to do. The most important thing we need to do is to become an active user of social and upload contains quality to get maximum results. At first payment on this site using bitcoin but now has turned into bitMiles. Here is a video tutorial how Bitlanders works. 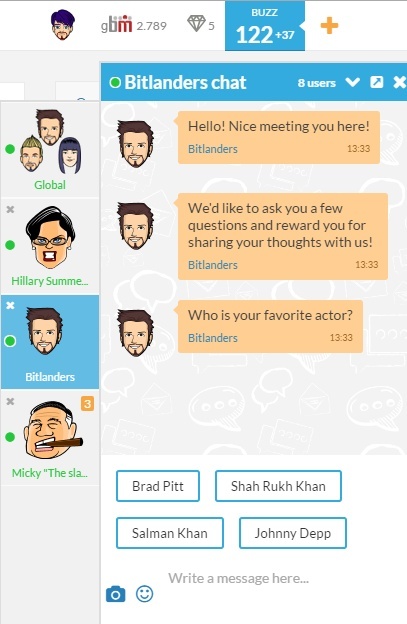 The best features and fun of bitlanders is GLOBAL CHAT. Global Chat is a feature bitLanders given to users to interact with each other both in public or in private. 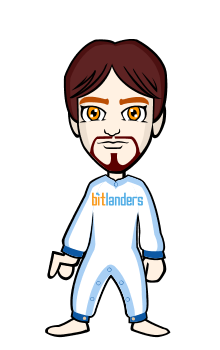 Through global chat we can get a lot of new friends who can help us be developed in bitLanders. At first Global Chat just a regular chat box that allows us to interact with each other, but for now and one month ahead, GLOBAL CHAT give us a chance to get bitMiles Loyalty Points. In general, we know that Global Chat is only used for sharing thoughts with another user and place for us to talk directly with other bitLanders users. But this time Micky-the-slanted-salerno has announced through blog about bitLanders Survey where you can answer the question of Hillary Summers on various topics are again the talk, and of course you will get a 10 bitMiles Loyalty Points for every answer we give. For more details you can visit the BLOG of Micky-the-slanted-salerno. But I am a bit surprised it turned out now to answer any questions from Micky or Hillary can get 30 bitMiles Loyalty Point. 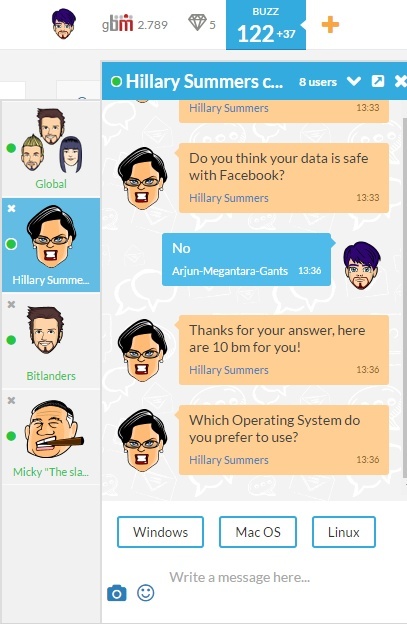 To start your chat with Hillary you just click Global Chat button is located at the bottom right of the page, and automatically Hillary Summers will begin asking some questions with various topics and asked for your opinions, the topics in question is still warm the talk in the community. Hillary Summers will ask some random questions with specific topics. You need to answer all questions to get more bitMiles Loyalty Points. Do not worry if the answers that you give right or wrong because you will still receive 10 bitMiles Loyalty Points for every answer you give. 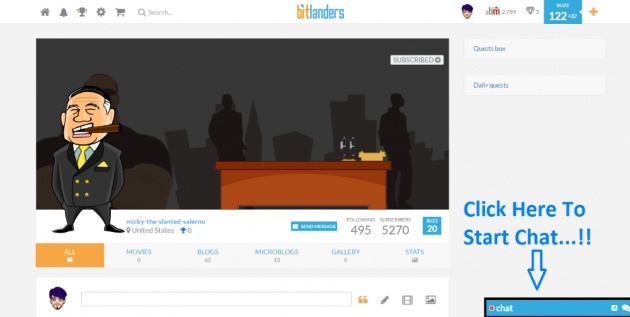 In addition to getting 30 bitMiles Loyalty Points through bitLanders Survey on Global Chat after you answer a few questions, and Micky also gives us the opportunity to write a blog about bitLanders Survey on Global Chat and share information about the survey to other friends so that they can also feel the opportunity to share their thoughts and opinion with Hillary-Summers. 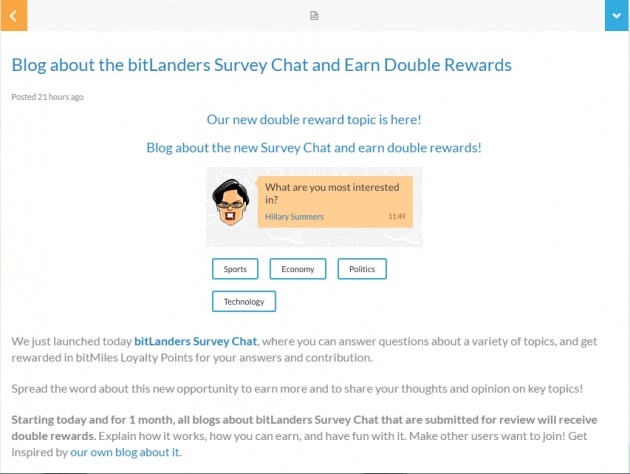 Of course in addition to getting the chance to write a blog about bitLanders Survey we also get a chance to get Double Rewards direct buzz of blogs that we send for review and given rate. For more information you can read in BLOG of Micky-the-slanted-salerno. Recently, I was very surprised when opening the Global Chat. I am shaken by chatting together three important people at once. They are Bitlanders, Micky-the-slanted-salerno, and Hillary-summers. I was confused with whom to start a chat. Very impressive to chat with them, it's an unforgettable experience to share my thoughts with the founders bitLanders and share opinions on various topics of interest. I have been many times to share my thoughts with them in the Global Chat, but in this blog I can not show you all of my chat with them, because it is limited by a system of writing blogs in bitLanders. So I just show you some of the questions submitted by them. But if you want to feel yourself the pleasure of a chat with them you can open a Global Chat now. I start a chat with Hillary Summers, the first question he asks about social media Facebook. Here's a brief snippet of my chat along with Hillary. Hillary Summers Question : Do you think your data is safe with Facebook?? Social networking is famous named FACEBOOK has developed so rapidly as the number of new users until now. Facebook has become a trend among teenagers, parents, teachers, academics, Officials, to the celebrities did not miss registering themselves for an account on the site. But lately, there are a lot of rumors that many users Facebook account saying that their accounts breached by hackers, even my own personal account has also been in collapse by foreigners. I think Facebook's security system is very weak. An account on Facebook very easily infiltrated, compromised, and even staked out by other users. Very fun to share my thoughts together Hillary. After answering all the questions given Hillary Summers I proceeded to answer questions from Bitlanders. Here's a brief snippet of my chat together Bitlanders. Bitlanders Question : Who is your favorite actor? Backed with a handsome face Shah Rukh Khan can play movies with 5 different facial expressions while Shah Rukh Khan is very reliable play various roles in his films. The proof, he can portray any character, be it criminal, a man full of love and a variety of other roles. After answering the questions of my Bitlanders. I continue answering questions by Micky-the-slanted-salerno. here's a brief snippet of my chat together Micky on the first question. Micky Question : Would you open to considering International Real Estate Buying Opportunities?? If I have a lot of money of course I would buy a piece of land in Real Estate since I believe has a plot of land with all buildings on it is the very thing I dreamed long ago. 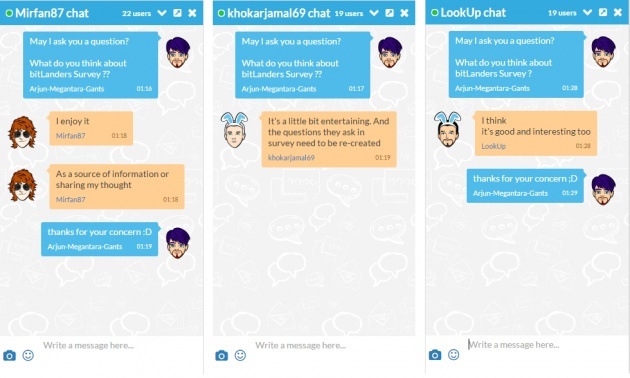 I took some samples of my best friends in bitLanders and asked what they thought about bitLanders Chat Survey, and the results of all user gives positive response to the survey. Here's my short piece together the active user asking "What do you think about bitLanders Survey ??". Many users who have made a tutorial about bitlanders and all the features in it either through video or blog. They are very enthusiastic and wanted to share a pleasant experience when using Global Chat feature. As one of our friends Deepak-Meena makes a video tutorial how to start a chat with Hillary in the Global Chat using a mobile phone. The tutorial video you can see below. 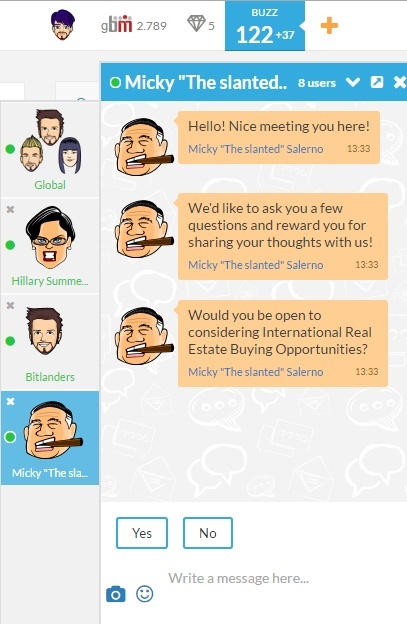 As one big fan of bitLanders, I think Global Chat is an excellent new features and attractive design with simple and user friendly. But I think there is one drawback of the Global Survey because the questions are limited to US territory so users who are outside the US tend to be answered carelessly. I hope the future admin will give us more questions about daily life so that all users from different countries comfortable being here. This blog is 100% the result of a personal handwritten. If you want to divide this blog please include the name of the author. If you think this blog interesting and useful for you, please Subscribe my account and do not forget to buzz and comments.